Since 2013 I have been working closely with Sean Martin and Donek Snowboards. When I first met Sean his boards were making an appearance on the able bodied SBX NorAm circuit. During the season of 2012 I tested almost a dozen different boards in the hopes of finding the right board. Everything from Kessler, Oxess, Apex, Greene and Volkl. I wasn’t worried about who had the most reputable name. At that time i was focused on adaptability and customization. As an adaptive athlete we needed boards specifically designed to fit our disability. Prior to my career as a professional athlete I was self-employed as a custom woodworker. I had also spent a good amount of time working in a machine shop as CNC lathe operator. Because of this I had an understanding of how things were made and a constant desire to learn how snowboards were manufactured. The first few boards I made with Donek were stiff and rode a little rough. If there’s one thing that kept me coming back it was Sean’s dedication to create a quality product. If something wasn’t right he was determined to fix the problem even if he had to make a dozen prototypes. We must have tried a million different shapes, flex patterns, cores, and sidecuts. We tried everything to be sure that we had it right. By 2014 Donek snowboards had produced the Saber, which is the most successful boardercross board on the ParaSnoboard Circuit. With three Paralympic medals and over 30 World Cup titles the Saber made its mark in the industry. Research and development didn’t end there. In the years following the Paralympic Games, Donek continued to work with riders and programs across the country to make improvements. 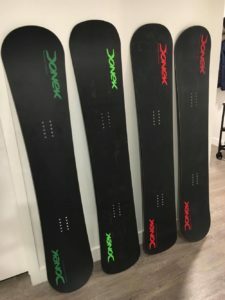 By 2016 Donek’s snowboards had seen great success, however there was ongoing skepticism among able bodied WC racers regarding the materials used by Donek Snowboards. When Donek Snowboards came onto the able bodied boardercross scene things were different. It was during a transitional phase in the sport where riders were open to trying new things. Courses were changing and the format went from four to six riders. Open courses forced riders to move away from boards with a tight variable sidecut radius and in the direction of a large fixed radius with tapper. Donek was still very much influenced by its background in Alpine racing so it was lacking the necessary feedback to keep up with the modern SBX movement. Athletes were sticking with European manufacturers simply because that’s what was winning races. Back in 2010 the top 20 athletes on the circuit seemed to be riding one of only two board brands. As a consumer it’s very hard to steer from the influence of market saturation. Especially when you’re career is depending on it. 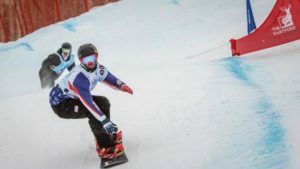 If you’re a NorAm level rider and fighting to earn your spot on the national team, what’s the easiest decision you have to make in terms of finding the right board? Ride what everyone is winning on!!! Very few will step outside the box and take a chance with a different manufacturer. 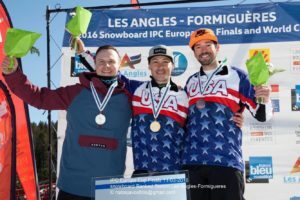 Meanwhile Adaptive snowboarding made the Paralympic Games and all of a sudden there were tons of athletes willing and determined to work with board manufacturers for the perfect board. Today I often hear athletes question the quality of Donek race boards because of something they’ve heard. I usually follow up with “Have you tried one lately?” Because the boards today aren’t what they were 7 years ago. Having said that neither is my riding. If you had asked me 7 years ago to write a blog about Donek Snowboards I would have no right to speak on the matter. However today I am 100% confident in my riding ability and know that I’m capable of giving quality feedback. In regards to claims about Donek’s base material. Almost every time I’ve heard this claim it comes from someone who doesn’t understand the complex science of base structure or waxing. Today SBX board manufacturers are all running top quality P-Tex. The difference is in the grind. I’ve heard some of the top techs in the world say that Donek’s base material comes off the press flatter than any other board on the market. The core materials used for Donek snowboards also seem to withstand expansion and contraction quit well. I have a board that’s 3 years old and still holds true when placed next to a true bar. I would never make claims about a competitors’ base material but I can certainly stand behind the results that I’ve seen firsthand with Donek Snowboard’s base material. I’ve seen Donek snowboards pull from a pack of riders in a straight away or out of a start gate. However, on any given day there are variables that change the outcome of these results. A few weeks ago while training with the US Team at Copper Mountain we ran some glide drills. The entire team started at the top of the mountain and we ran the entire length of the cat track. We did this a half dozen times, each time changing the order in which we dropped. We tried it with and without tucking. Each time trying our hardest to test different scenarios or remove the variable of human error. All day I consistently saw Donek Snowboards move from the back of the pack to the front of the pack against top European boards. After moving to the front of the pack the Donek boards even continued to pull away from the other riders despite the open draft. Every rider that day was running the same wax and most even had the same grind. Although this isn’t the perfect test it was confirmation that Donek Snowboards has and will continue to run successfully alongside the best race boards in the world. Donek has had to overcome a lot of skepticism over the years and I will do everything in my power to make sure they get a fair shot. Each rider has a different preference and at the end of the day that’s why we have options. If everyone rode the same board we would be like Nascar. Where’s the diversity in that? One thing is for sure, Donek has fought hard to revolutionize race boards manufactured here in the states and they are here to stay. Their product stands true and they will continue to help riders reach the top.